Guinea's Grand Imam, El Hadj Mamadou Saliou Camara, tells his fellow clerics: "If there is any doubt at all, then no one must touch the body." The Grand Imam of Guinea, El Hadj Mamadou Saliou Camara, walks through the streets of Kindia with U.S. Ambassador, Alex Laskaris. Together they hope to end Ebola denial. Hadja Bintou Conte, a mother-of-five who dyes textiles for her living, tells her neighbors that Ebola is definitely real. But they're not always ready to agree. His words are vital. Liberia and Sierra Leone look set to turn the corner in the battle against Ebola, but Guinea still faces challenges. Some people still hide Ebola sufferers at home. And 60 percent of Ebola cases in Guinea are related to unsafe, traditional burial rituals, the World Health Organization says. So in Kindia, the country's leading Muslim cleric called on people to adopt safer funeral practices. Speaking in the local language, Soussou, he read them the riot act. "There is nothing in the Koran that says you must wash, kiss or hold your dead loved ones," he told NPR after his speech. "I agree, tradition is important. But everyone must find a way to respect the dead and observe burial rites without putting themselves or anyone else in danger of catching Ebola." It may not seem an obvious partnership, but the American ambassador to Guinea has linked up with the Grand Imam to fight Ebola. Alex Laskaris says outsiders alone won't stop the spread of the virus; the Grand Imam and other religious leaders must play a key role. "One of the things I tell people about Guinea is the state is weak and has been weakened over time through poor management," says Laskaris. "The society is very strong, and I think in contrast to Liberia and Sierra Leone, where the wars destroyed everything, the fabric of traditional leadership in Guinea, whether it's religious or customary, is really strong. And these guys get respect the old-fashioned way: by earning it. And so they are the ... leaders who you appeal to." One such individual is Karamba Salim Diaby, an imam who is the secretary-general of the city's Islamic League. Many people deny the existence of Ebola because they claim not to have seen anyone dying of the hemorrhagic virus, Diaby says, while others blame foreigners for importing Ebola into Guinea. "Humans are always afraid of what they don't know," he adds. "They just accuse you Western people for injecting this virus into Guinea and Liberia and Sierra Leone. As the Imam said today, there is a confidence crisis between the population and the government." Diaby adds that many Guineans don't trust the authorities, whom he accuses of downplaying the problem of Ebola, thereby fueling resistance to those trying to raise awareness about the virus. The U.S. ambassador addressed the assembled imams in Soussou and French, to the delight of the clerics. They chanted "Allahu Akbar" — God is great — several times as Laskaris spoke. The ambassador has spent the past week sharing his message in southern Basse-Cote, the lower coastal area of Guinea where anti-Ebola efforts have been met with resistance. Some people in that region believe that "the safe burial teams were less than fully respectful of religious tradition and of cultural tradition," he says. "There is no future for Ebola treatment in Guinea if we're not checking that box." The health authorities are dispatching burial teams to ensure that dead bodies, still toxic with Ebola, are safely removed from homes and treatment centers. But unsafe burials have been reported in different regions, proving a challenge to the government's target of zero Ebola cases by mid-March. Those caught hiding Ebola patients, or carrying out secret burials, could face prosecution. Sitting behind rows and rows of imams in caps and colorful boubous, women wearing white listened attentively to their male religious leaders. And they are typically the principal caregivers for Ebola victims who stay at home. Hadja Bintou Conte, a mother of five, says she believes Ebola exists and shares that message in her community. But it will take time, she says, to persuade some naysayers. The Grand Imam is certain he and other religious leaders will gain the confidence of people currently in denial about Ebola. But he admits it's a battle. To succeed, you have to find the right medium for the message. "Radio is important here," Laskaris says. "The Internet is not a factor. This is old-school, pre-digital diplomacy. It's making contact eye to eye, person to person, sitting under the mango tree. And it's also listening to people's fears and finding out what is motivating young people to throw stones, women to bar us from entering their houses. In the meantime Ebola, you know, is like a forest fire. You've gotta get every single ember out because that one ember you forget can reignite the whole thing — in Guinea and in the region." And there's a bit of good news about the battle against Ebola. Liberia and Sierra Leone appear - key word there, appear - to be turning a corner on Ebola. But neighboring Guinea still faces challenges. Some people there still hide people suffering from Ebola at home, and unsafe traditional burial rituals are helping the virus spread. Sixty percent of Ebola cases in Guinea are related to those burials, according to the World Health Organization. 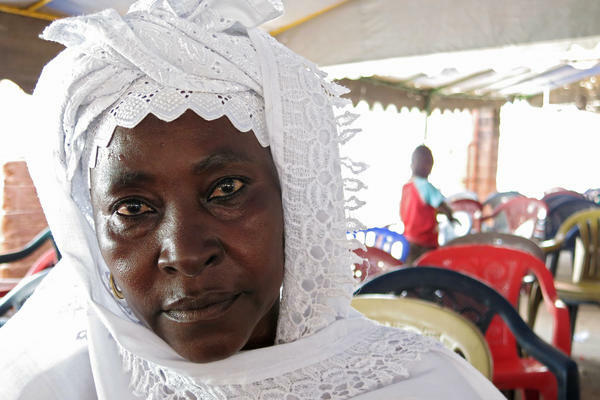 NPR's Ofeibea Quist-Arcton traveled to Guinea's third-largest city where the country's leading Muslim cleric is calling on people to adopt safer funeral practices. OFEIBEA QUIST-ARCTON, BYLINE: Kindia is an important city and a major crossroads in Guinea, a country the size of Oregon. But Kindia has had its fair share of fear and suspicion about Ebola. 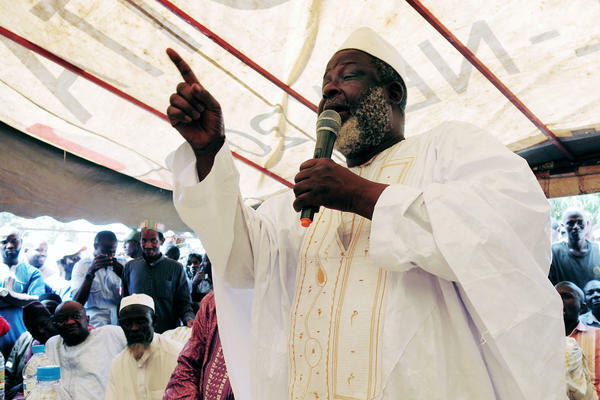 QUIST-ARCTON: Over the weekend, Guinea's Grand Imam, El Hadj Mamadou Salio Camara, gathered together hundreds of his fellow clerics and read the riot act in the local language, Soussou. EL HADJ MAMADOU SALIO CAMARA: (Speaking Soussou). QUIST-ARCTON: "With Ebola, you have to do more," roars the barrel-bellied cleric with his white beard and mustache, distinguished in a snow-white boubou, the traditional flowing gown of West Africa. El Hadj Camara tells his fellow imams that Guinea must adapt if its customs mean people are dying of Ebola. He repeated this after his address in an interview with NPR. CAMARA: (Through interpreter) There is nothing in the Quran that says you must wash, kiss or hold your dead loved ones. I agree, tradition is important, but everyone must find a way to respect the dead and observe burial rites without putting themselves or anyone else in danger of catching Ebola. QUIST-ARCTON: It may not seem an obvious partnership, but the American ambassador to Guinea has linked up with the grand imam to fight Ebola. Alex Laskaris says the answer to stopping the spread of the virus won't come from outsiders. He says it takes leadership, with the grand imam and others playing a key role. U.S. 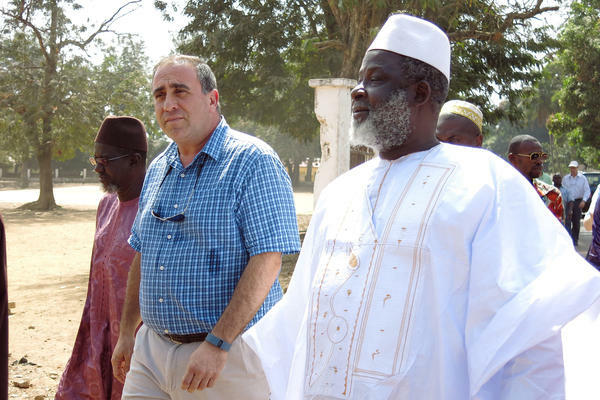 AMBASSADOR ALEX LASKARIS: One of the things I tell people about Guinea is the state is weak. It has been weakened over time through poor management. Society is very strong. And I think in contrast to Liberia and Sierra Leone where the war has destroyed everything, the fabric of traditional leadership in Guinea, whether it's religious or customary, is really strong. And these guys get respect the old-fashioned way, by earning it. QUIST-ARCTON: Headmaster Karamba Salim Diaby is also an imam. He says many people deny the existence of Ebola because they claim not to have seen anyone dying of the hemorrhagic virus. Others, he says, blame foreigners for importing Ebola into Guinea through ignorance. KARAMBA SALIM DIABY: They just accuse, you know, you Western people for injecting this virus into Guinea and Liberia and Sierra Leone. You know, there is a confidence crisis between the population and the government. So they don't believe in them. So that they think that the Red Cross, when they come, they try to contaminate people. So this is why they resist against this Ebola problem. QUIST-ARCTON: The U.S. ambassador also addressed the assembled imams in Soussou and French. Laskaris spent the past week traveling around southern Basse Cote, the lower coastal area of Guinea that includes Kindia and other areas of persistent denial and resistance to Ebola. He says he learned that there can be no change unless Guinea's customs are honored. LASKARIS: And above all, it involves an absolute respect for the rituals of death. And one of the areas we've had problems in Basse Cote was the perception that some of the safe burial teams were less than fully respectable of religious tradition and of cultural tradition. There is no future for Ebola treatment in Guinea if we're not checking that box. QUIST-ARCTON: That's why Laskaris says he's here meeting the religious leaders. Burial teams are dispatched to ensure that dead bodies still toxic with Ebola are safely removed from homes and treatment centers. But unsafe burials continue, proving a challenge to the government's target of zero Ebola cases by mid-March. Those caught hiding Ebola patients or carrying out secret burials could face prosecution. Sitting behind rows and rows of imams in caps and colorful boubous, women wearing white listened attentively to their male religious leaders. Women are the principal caregivers of people kept at home who may be Ebola sufferers. Hadja Bintou Conte is a mother of five. HADJA BINTOU CONTE: (Foreign language spoken). QUIST-ARCTON: Hadja Conte believes Ebola exists, and says she shares that message in her community but that it'll take time to persuade some naysayers. The grand imam says he's confident that he and fellow religious leaders will gain confidence of people currently in denial about Ebola. But he admits it's a battle. QUIST-ARCTON: The imam's ally, U.S. Ambassador Laskaris, says they're learning how best to relay that message. LASKARIS: Radio's important here. The Internet is not a factor. This is old-school, pre-digital diplomacy. It's making contact eye to eye, person to person, sitting under the mango tree, and it's also listening to people's fears and finding out what is motivating young people to throw stones, women to bar us from entering their houses. In the meantime, Ebola, you know, it's like a forest fire. You've got to get every single ember out because that one ember you forget can reignite the whole thing in Guinea and in the region. QUIST-ARCTON: The same sentiment you hear across Guinea's borders in Sierra Leone and Liberia. Ofeibea Quist-Arcton, NPR News, Kindia.